Against my better judgement, I watched, "Dancing with the Stars" last night. 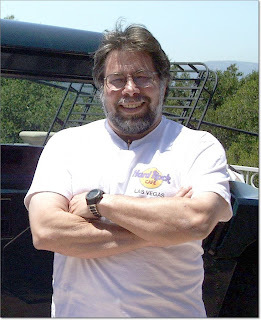 I was pleasantly surprised to see a couple of geeks out there, but the best one of all was Apple's co-founder Steve Wozniak. He was adorable, suprisingly limber, and looked like a giant Ewok. Coming from me, that's a compliment. I liked him, as well as David Alan Grier. Who also did really well. My favorite part of watching DAG last night, was watching him not be able to just behave like a normal person. Much like Conan, everything he does comes across like he's shooting an on-location comedy segment. I loved that, and it gave me quite the chuckle. I also found the dancing cowboy amusing, and got a surprisingly big kick out of seeing Melissa from, "The Bachelor" doing a really beautiful dance number in a hideously early 90's Cher-like, made of netting, sparkly top thing.